Bicycles expand the accessibility of cities and constitute a healthy, sustainable form of mobility. Furthermore, an increased use of bicycles will reduce tailbacks. Yet many commuters opt for a car when they go to work. That is why the government intends to make the Netherlands even more bicycle-friendly. 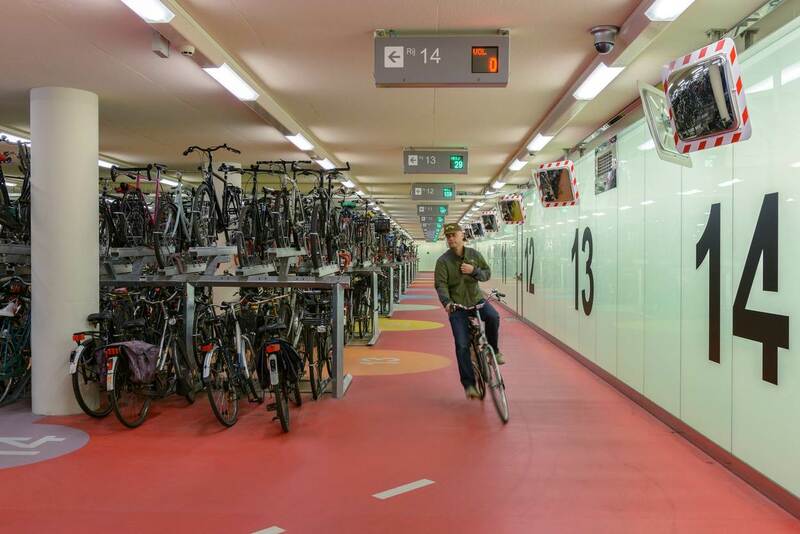 Cyclist in the bicycle garage at Rotterdam Central Station, which has room for 5190 bicycles. The construction of bicycle tracks and encouraging the use of bicycles is the responsibility of municipalities and provinces. Proper collaboration is essential in this respect. Some situations call for national arrangements. For that reason, the central government is joining forces with the provincial and municipal authorities. One such collective effort is the Tour de Force programme: the aggregate governments’ collective bicycle policy extending up to 2020. Tour de Force intends to raise the number of bicycle kilometres in the Netherlands by 20 per cent in the next ten years. Within Tour de Force, the governments review the main challenges involved in making cycling a more attractive option. In addition, they explore smart solutions to these challenges, together with companies, NGOs, and knowledge platforms. Such as the CROW-Fietsberaad knowledge centre, the Dutch Cycling Embassy, and the Fietsersbond/Dutch cyclists’ union. How can we improve the alignment of bicycles and public transport? How can we use smart technologies for the benefit of cyclists? For example, traffic lights that turn green upon the approach of a cyclist. Or a system that points out free spaces in cycle parking facilities. Or a chip in bicycles to enable easier retrieval of stolen bicycles. How can we ensure that elderly people can continue to ride their bicycles safely? Are there smart ways to fund expensive bicycle measures? The central government can assist by bringing parties together, commissioning research, conducting experiments, amending regulations, and in some cases, by co-funding urban measures. For example, the central government is co-funding the renovation or construction of additional bicycle parking facilities at railway stations. The construction costs are usually divided among municipalities, provinces, transport regions, and the State. The forecasts show that the railway stations will require a great deal of additional parking spaces in the next 15 years.